Hook-and-loop attachment for quick and easy set-up for use in any location. Toppers & Clips Sold Separately. This ivory table skirting is an inexpensive way to convert a worn out table into an attractive display. 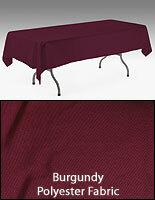 The durable polyester material is easy to work with and will last through many years of usage. 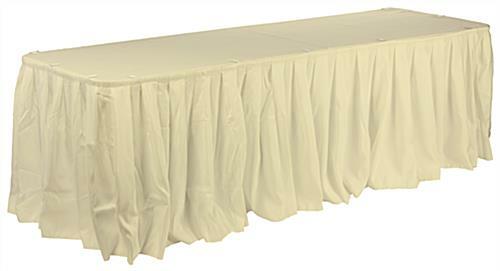 Each ivory table skirting is made from polyester fabric that is machine-washable and wrinkle-resistant. 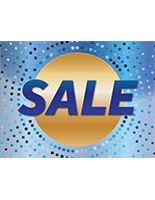 There is no need to send this skirting to a dry cleaner, thereby saving hundreds of dollars on cleaning bills. Made with a classic and elegant ivory finish, this wedding table skirt will complement nearly any color scheme. The neutral tone of this tabletop drape is the preferred color choice for most brides.  This ivory table skirting, also known as a table cloth features box pleat styling to give a finished look of elegance to your folding table. 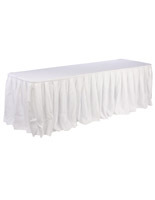 The ivory table skirting fabric will drape naturally and smoothly to the floor on all sides. This ivory table skirting, wedding table skirt has a generous size that can be used to wrap around a round or rectangular table. 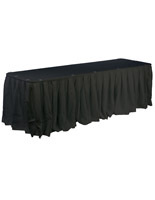 The 17-1/2' long fabric fully covers a 6' rectangular, 60" or 66" round tables and wraps around three-sides of a 8' or two 6' rectangular tables. A ivory table skirting is made with hook and loop fasteners on the back, making it easy to attach the skirts to the edge of the table. The clips and toppers are sold separately in an effort to encourage creative color designs. A table cover, ivory table skirting is perfect for catering halls, rentals, restaurants, hotels, trade shows, meetings and even your dining room table. Buy all of your restaurant's linen needs right here! 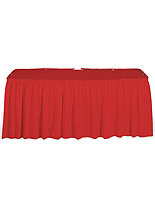 Make your presentation look more impressive and outstanding with this wedding table skirt. Please Note: This product ships with the table skirt only. The table toppers and clips are not included.